After some posts and interviews criticizing "viral" infographics (1, 2, 3), it may look bizarre that I am embedding the talk above, by Visual.ly creative director, Jess Bachman. It shouldn't. There are several points in there that got me interested because they reflect recent concerns of mine. You will have to dodge risky jokes involving Timothy McVeigh and a bit of predictable Tufte-bashing, though. Picking on Edward Tufte seems to have become a sport of choice of designers lately. This is sad. Agreeing and disagreeing with Tufte is part of the necessary conversation about the future of information graphics and visualization Andy Kirk has written about. Tufte is still a founding father of our field. That said, if you watch Bachman's talk right after reading Andy's article, you will notice that they share some topics: How intimidating sententious "experts" can be for newcomers; the need to consider the context and goals of a graphic before you can evaluate it; and, in the case of Bachman, how important it is to make readers' lives easier by asking "what the story is" in the information and "why I should care" about it; also, the role fun and humor play. I'd like to briefly comment on some of those points, as they are relevant but can be easily misunderstood. It looks nice, doesn't it? And it likely went viral. But is it really useful? The problem that I have with this graphic, and the reason it is not so great as it could be —objectively, regardless of its intended audience— is that its data is not arranged so it can be easily grasped, compared, and related. 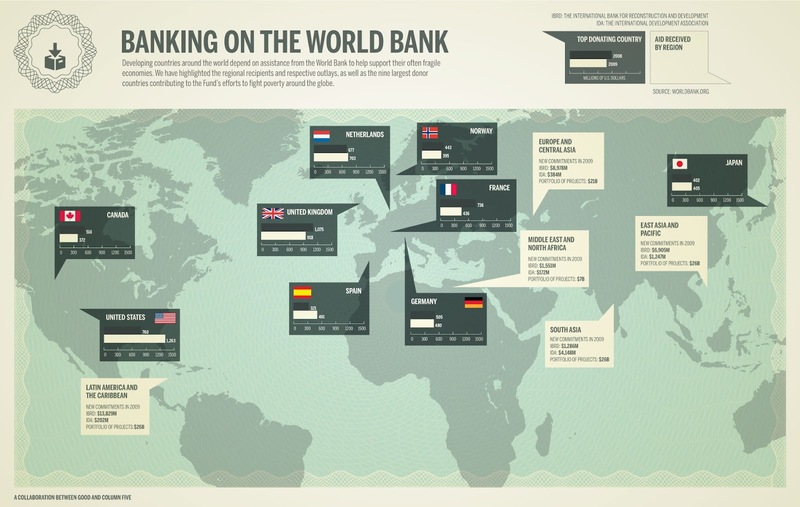 Moreover, the goals suggested in the graphic's intro ("I'll allow you to audit the World Bank") are not fulfilled. The designer created a pretty picture (a map) and threw text boxes and numbers around it, rather than thinking about what the graphic should show, and then about making it look pretty. This is a self-defeating strategy in any project. 1. Which country was giving more money in 2009? And in 2008? 2. Which country gave less money? 3. Which country was giving less money in 2009 than in 2008? And more? 4. I can see absolute figures here, but what about per capita donations? Wouldn't those provide a much clearer, deeper picture of who really spends more on humanitarian aid? I believe they would. This summarizes the issues I have with modern so-called "infographics." I am a sucker for good-looking charts and maps; I also enjoy humorous graphics, depending on the story. After all, humor can be functional, as I've pointed out before. But if you prioritize fun over structure, if you care about visual appeal alone and disregard the quality, accuracy, completeness, consistency, and depth of your information, you will not be creating an infographic. Instead, you will end up with a colorful layout that presents a bunch of decontextualized and grossly simplified factoids and figures, which is what we see too often nowadays. And my question is: Isn't it be possible to be deep, useful, and fun at the same time?